A delegation from China will visit Argentina this month to discuss the construction of a nuclear power plant, signaling potential progress in a deal that could increase Beijing's deepening influence in the South American nation. 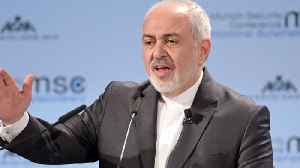 Mohammad Javad Zarif played a key role in Iran's 2015 nuclear deal. Now, CNN reports Iran's foreign minister is about to resign. Zarif wrote on his Instagram account, "I sincerely apologize for the..